Which States Are Winning the Business R&D Race? Let’s start with the ordering. California’s rank as #1 is no surprise. But New Jersey’s ranking as #2 and strong growth is unanticipated (though it’s consistent with NJ’s relatively high ranking in our Geography of the App Economy study). 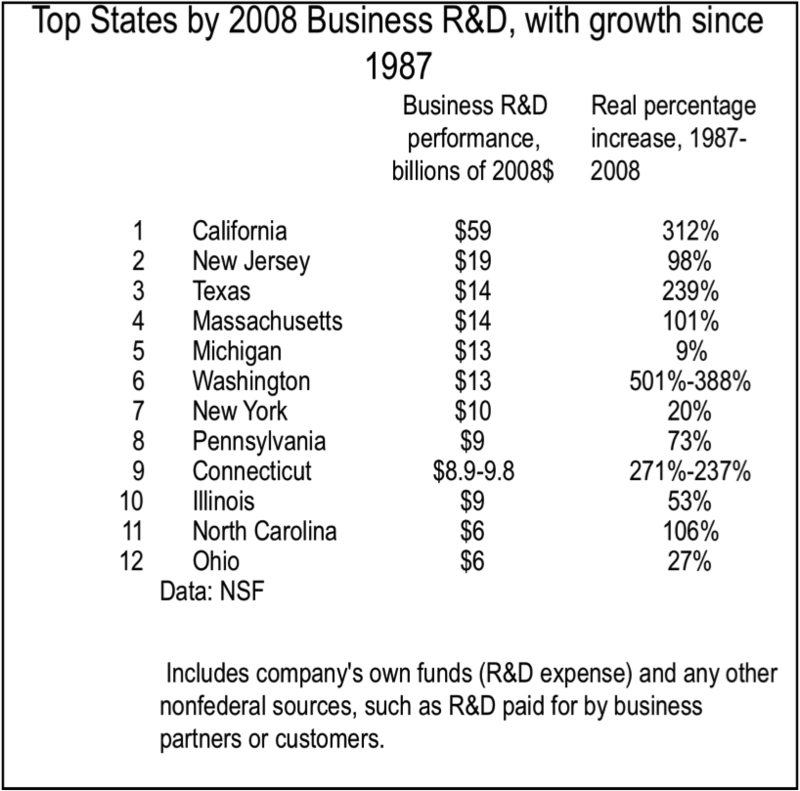 New Jersey R&D grew almost as fast as Massachusetts over the 1987-2008 period. The R&D spending in NJ, PA, and CT came mainly from the pharma industry. I’m going to look to see whether these states have tried to build on their advantages, or whether they have let them dissipate. Also a surprise is Michigan’s continued high ranking. Auto industry R&D has not been growing very fast. Nevertheless, the industry has poured an enormous amount of money into Michigan over a long period of time, providing a potential base for future tech growth. Indeed, our upcoming study on tech and economic development identifies the Detroit area as having a very interesting cluster of tech-related companies. *Full disclosure–I serve on a National Academy of Sciences panel which is conducting “a study of the status of the science, technology, and innovation (STI) indicators that are currently developed and published by the National Science Foundation’s (NSF) National Center for Science and Engineering Statistics (NCSES).” This post uses only public information contained in the cited study.